Is there a better alternative to Master the Facts Multiplication? Is Master the Facts Multiplication really the best app in Mathematics category? 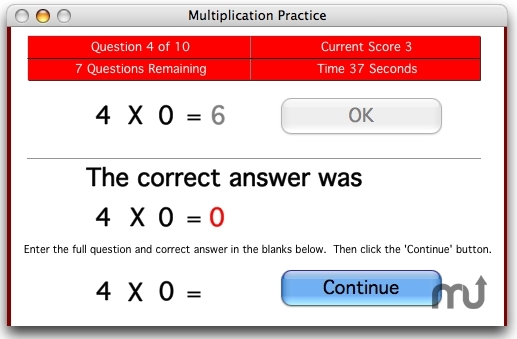 Will Master the Facts Multiplication work good on macOS 10.13.4? Master the Facts Multiplication is a no-nonsense drill and practice program to aide students in learning multiplication facts. This program was created in response to teachers requesting a "non-game" software tool to use in their classrooms to teach multiplication. It is currently used in homes and schools around the world. Students using Master the Facts Multiplication for as little as 10 minutes a day to practice multiplication skills may demonstrate marked improvement in multiplication skills on quizzes and tests. 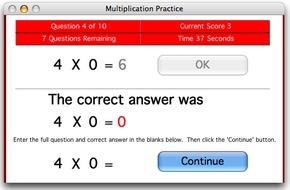 Master the Facts Multiplication needs a review. Be the first to review this app and get the discussion started! Master the Facts Multiplication needs a rating. Be the first to rate this app and get the discussion started! Includes English, French, German, Italian, Polish, and Spanish language prompt/display options. Compatible with network score collecting via FRS Score Collector.